Hundreds of Jews and Arabs are taking part in a Jerusalem march against the occupation. Saturday's event is the first in a series organized by Standing Together, an umbrella movement consisting of pro-peace organizations and left-wing parties, marking 50 years since the Six-Day War. The rally is meant to "protest against the continued Israeli control over the territories and especially East Jerusalem, and in favor of a peaceful solution and justice for both peoples," the movement said in a statement. Earlier Saturday, a Palestinian was shot dead after wounding two civilians and a border policeman with a knife in Jerusalem's Old City. 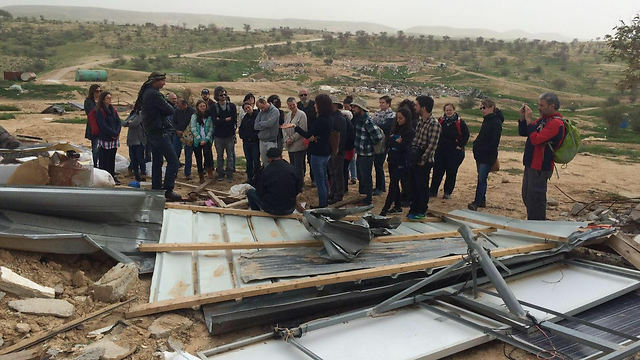 One of the organizers, Itamar Avneri, said the incident "was a painful reminder of the price of the occupation. We convey wishes of swift recovery to the wounded, and hope we don't see any more such incidents or fear on the city's streets. This has to end." The march began at Gan Hasus in the city's center and concluded in the Old City with a rally near Jaffa Gate. Knesset Member Zehava Galon, the chairwoman of the Meretz party, addressed the rally, saying: "We can't keep the conflict with the Palestinians on the back burner, when the flame is on top of a barrel bomb. The stabbing attack in the Old City exposes the illusion that it's possible to deprive an entire people of rights and sovereignty without the desperation turning into horrible hatred and violence." Mohammed Abu Hummus, the head of the popular committee of Isawiyah in East Jerusalem, urged "anyone who believes in the Palestinian people to stand against the racist [Israeli] government. "The left needs to step up and help, take to the streets and demand change," he added. Avi Buskila, director of Peace Now, expressed hope for unity: "The rightist settler government and the occupation want hatred to take over hearts and control the streets, with Jews hating Arabs, Mizrahim hating Ashenazim, rightists despising leftists, Ofakim hating Tel Aviv. They are afraid because they know we will win, all of us, Jews and Palestinians, Jerusalemites and Tel Avivians, Mizrahim and Ashkenazim, Ethiopians and Russians, men and women, all of us together will win." Over 280 architects, engineers and building planners send an open letter to Prime Minister Netanyahu, objecting to ‘the ongoing discrimination against the Arab population in Israel in the area of housing and planning’; The letter claims that ‘natural growth on the one hand, and lack of planning on the other, have forced the Arab population to build without permits on a massive scale,’ and that demolishing these structures ‘violates morality and basic civil rights’; Among those who have already signed the letter are the dean of Bezalel’s Architecture department and professors from the universities of Ben-Gurion and Haifa. “The Arab-Jewish Planning Forum,” which includes professionals from the fields of building and architecture, sent an open letter to Prime Minister Benjamin Netanyahu on Sunday. The letter opposes the building policies set forth by most Israeli governments since the country’s founding, which the forum sees as consistently discriminatory. So far, the letter has managed to collect the signatures of over 280 building planners. 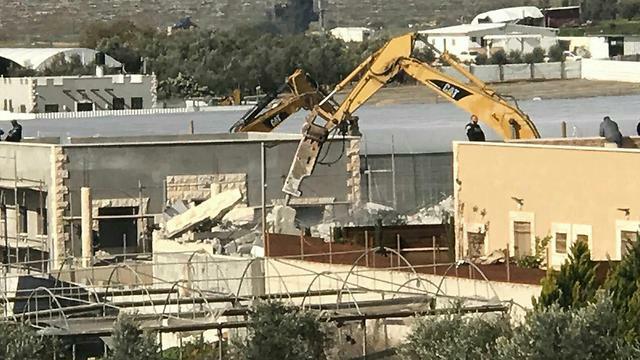 Specifically, the “Building Planners’ Letter,” as it has been dubbed, describes a lack of issuing building permits for Arab communities, while simultaneously going ahead with the demolition of illegally built structures within those communities. The Building Planners’ Letter stresses that the lack of building permits—which would have allowed the Arab population to legally build more structures—brought on illegal building within those communities in an effort to meet the basic needs of this growing demographic. “Natural growth on the one hand, and lack of planning on the other, has forced the Arab population to build without permits on a massive scale. The demolition of these homes, constructed out of distress in the absence of equitable planning, violates morality and basic civil rights. “House demolitions are not the answer to building without permits. We demand an immediate end to the policy of house demolitions and call upon the authorities to advance worthy and fair planning policies—together with local communities—through which housing construction will be regulated and the needs of the population will be met." The Arab-Jewish Planning Forum was founded several weeks ago and is comprised of planners, architects and engineers who wish to combine their professional work with creating social change. Among those who have already signed the letter are: Architect Yuval Yaski, the dean of Bezalel Academy of Arts and Design’s Architecture department; Prof. Oren Yiftachel, from Ben-Gurion University; Prof. Rassem Khamaisi, from Haifa University; Architect Ayala Ronel; and Architect Amnon Bar Or. And are you now calling for more funds to be invested or also offering master plans and solutions? Despite not yet having a course of action, what do you as professionals say about what’s going on in the field of building and planning in Israel? 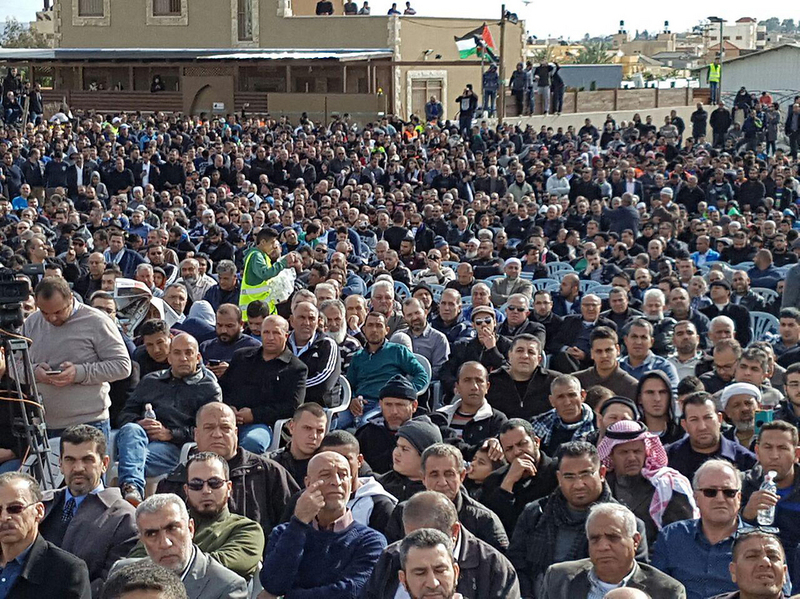 For the time being, the forum has yet to formulate a position on the resistance coming from members of the Arab community to building initiatives that have come from municipalities and government. 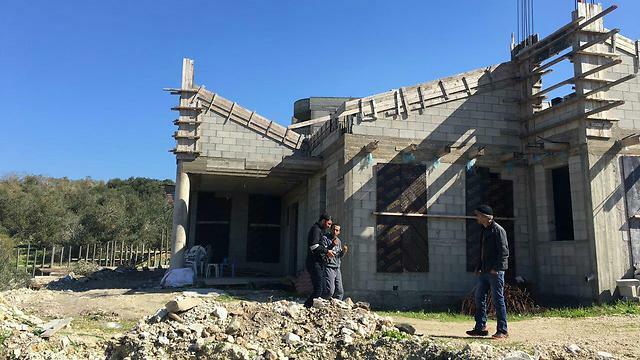 One such plan has been offered by the Jerusalem Municipality, which aims to regulate Arab building by retroactively issuing permits for certain buildings while demolishing others, in favor of building new structures that will meet the official building standards and requirements. There's a name for the reality in which a government that sees itself as representing only one nation determines the future of two nations and creates two separate and unequal systems. A picture taken on February 6, 2017 shows Israel's controversial separation barrier dividing east Jerusalem (L) from the West Bank village of Anata (R). They settled there in good faith; there’s a consensus on the settlement blocs; previous governments took care to build only on state land; it’s all the fault of the Palestinian law against selling land to Jews; property rights are sacred. These are few of the positions that have been tossed into the air in recent days, before and after the Knesset vote on the land expropriation law. The internal Israeli dispute created a cacophony of deceptions from both the bill’s supporters and its detractors from the center-right (Zionist Union, Yesh Atid). Both camps seemingly speak in parallel tracks that never meet, but only seemingly. The law’s supporters speak of good faith and of settlements without malice aforethought. If it was indeed in good faith, then how is it that the builders of the outposts have created rings upon rings of violent harassment around them and, with the aid of their private army (the Israel Defense Forces), prevent Palestinian farmers from reaching the parts of their land on which innocent mobile homes and villas have not yet been erected? The law’s detractors say that up to now, Israeli governments were careful not to establish settlements on privately owned land. Really? How many times do we have to repeat that this is a fiction? Beit El sits entirely on private land, as does Ofra. There are dozens more thriving settlements and outposts that were built in part or entirely on private Palestinian land that was seized for military needs – even after the Elon Moreh ruling of 1979, in which the High Court of Justice prohibited construction on privately owned land. Fertile agricultural lands were confined within the borders of settlements such as Elkana and Efrat, where they became recreation areas for Israeli walkers and lovers. The law’s supporters say that nowhere on earth is it impossible to purchase private land. But when British nationals buy homes in France and in Spain, it isn’t for the purpose of imposing British sovereignty. The law’s detractors make a distinction between state-owned land and privately owned land. A reminder: All seizure of land and construction in occupied territory, against the will of the conquered population, is illegal according to international law. The Jewish mind has come up with innumerable inventions, as the saying goes, in order to declare Palestinian-owned land as state land. Those for whom only private Palestinian ownership is sacred devalue international law and the tradition of sharing public land. They prove that to them, the Palestinians are a random collection of individuals, not a collective with historical, material and cultural rights to the area in which it was born and has lived for centuries, irrespective of any real estate classifications. The distinction between private and public, which the High Court of Justice makes with such joy, portrays the Palestinians as being entitled to live only within the crowded confines that conform to the records of the Land Registry Office. For us Jews, our Land Registry is with God. The law’s detractors say there’s a consensus on the settlement blocs and the land expropriation law messes things up for us abroad. Consensus? By whom? Not only the settlers but also the law’s detractors fail to count some six and a half million people, Palestinians, on either side of the Green Line (and us, a handful of Jewish Israelis). Both camps, the right and the center-right, simply do not see any problem with the fact that it is only the Jewish consensus that decides what will happen to both Jews and Arabs. After all, it’s been that way for decades, and that is the essence of the celebrated Jewish democracy. But yes, it is a problem. On the piece of land between the Jordan River and the Mediterranean Sea live two nations. There is a name for the reality in which a government that sees itself as representing only one nation determines the future of two nations and creates two separate and unequal systems of rights, laws and infrastructure, with the eager support of its people. It’s called apartheid – a crime according to the Rome Statute of the International Criminal Court, and also according to a global consensus that was created over the years.